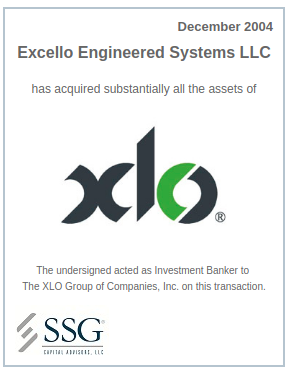 The XLO Group of Companies, Inc. The XLO Group of Companies, Inc. (“XLO” or the “Company”) operates as a leading tier-one manufacturer of die-cut and molded film and foam-laminated water shields for US, European and Japanese automotive companies. The Company’s products protect the various parts housed within automobile doors from water and dust. XLO was in the midst of executing a financial and operational turnaround and the resolution of its senior secured debt obligations. SSG was retained to assist the Company in exploring strategic alternatives. Working under a demanding timeline, SSG assisted the Company in completing a transaction that involved the sale of its business to private investors. The transaction closed in December 2004.